Nothing captures the warmth and wonder of nature like beautiful, real wood and nothing defines the spirit of your home like a unique piece of handcrafted joinery. Broadleaf Design is an entirely bespoke service which combines our passion for design, intimate knowledge of timber and traditional craftsmanship to create beautiful timber features that are as individual as the trees from which they originate. This can be on a design only basis or all the way through to installation. There is no 'standard' project or minimum budget. We have worked on projects as simple as single doors and as complicated as complete houses, across a spectrum of styles for all sorts of clients. 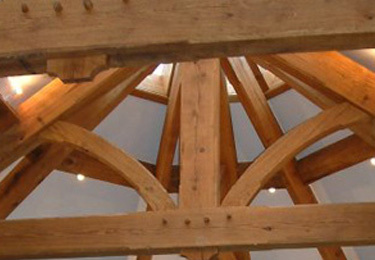 Typically we design beautiful bespoke oak roofs, staircases, libraries, garden rooms and feature windows. Traditional or modern, humble or majestic, we are always excited by a new project and would be very pleased to have the opportunity to discuss yours. 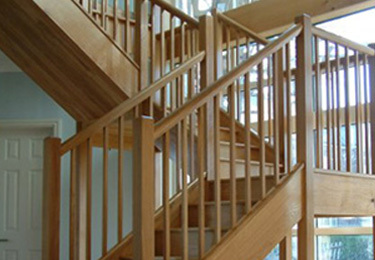 There is no such thing as a standard Broadleaf staircase. Each one is designed from scratch to suit the particular needs of the property into which it will be installed and the tastes of the client for whom it is made. 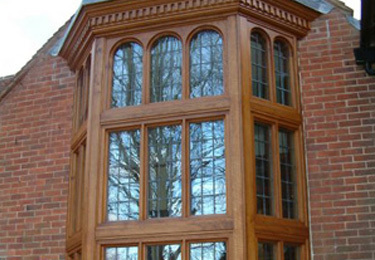 Broadleaf Design offer a complete range of green oak framing services. We work on projects of all sizes, from the supply only of a single feature truss to the design and construction of complex roof structures. Broadleaf Design can design, supply and install a complete range of bespoke joinery features including doors, panelling & cornicing, internal screen walls & libraries. The first stage is to discuss your project. We listen to your ideas and objectives and look at any plans, sketches or photos. From this we can offer some initial design ideas and ballpark costs and for more straightforward projects can normally move on to produce a more detailed quote and drawings once we have refined the design. On approval of these we can then take final details, confirm our quote and plan production and there is no design fee unless we attend site. For more complex projects, further discussions and a site visit are usually needed to evolve the design before producing detailed drawings. Structual calculations can also be necessary. A project of this kind normally involves a design fee to cover this and the drawings and calculations produced belong to the client with no obligation to use Broadleaf Design for the implementation stage. Timber for each project is carefully selected for its specific purpose. It is usually Oak, although we do introduce other timbers where appropriate and designs can also include other natural materials such as glass, zinc or iron. Whatever timber we use is sourced from trusted suppliers and sustainable forests. According to your needs we can either supply only or supply and install your project. Our skilled team includes joiners, glaziers, carpenters, oakwrights and cabinet makers who are managed by Broadleaf Design to ensure seemless delivery and the highest quality of workmanship. All Broadleaf Design projects are crafted in our extensive workshops in Wales.